Clas Björling on the bike at Quelle Challenge Roth on his way to the Swedish Ironman Distance Record. Gordo runs his way to 5th place Overall at Ironman Brazil. 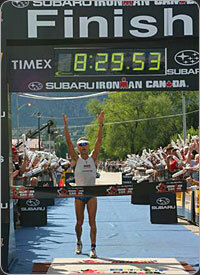 Gordo at Ironman Canada 2004 scores a career-best sub 8:30 finish featuring a blistering 2:46 marathon. Following five years of general endurance training, I completed my first Ironman in 1999 (11:06). Since that time, I’ve completed fifteen Ironmans and won the Ultraman World Championships. The most satisfying aspect of my recent race performance has been the consistency of results (my last six Ironmans all being completed under 9 hours). I have three things that I believe are essential to making progress in athletics: consistency, recovery and the right mental attitude. I believe very strongly that the last item in that list is by far the most important. I do a lot of work training my mind. The next most important is recovery. About half of the long distance athletes I know spend their lives on the edge of, or slightly over, the overtraining abyss. I believe this is the most overlooked aspect of superior performance. Finally, I believe that consistent work, rather than hard work, is what reaps the most dividends. I work with no more than six athletes at a time. This ensures that every athlete on my roster gets a large “share of mind”. Over the years, I’ve worked with a wide range of athletes (men, women, elites, agegroupers). I’ve found that I am most effective with athletes that are able to train alongside me (personally or at Epic Camps). I’ve been fortunate to train and study under the leading coaches in our sport – Scott Molina, John Hellemans, Dave Scott and Joe Friel. My personal coaching philosophy is a synthesis of their experience as well as my own triathlon career (eight years and counting).